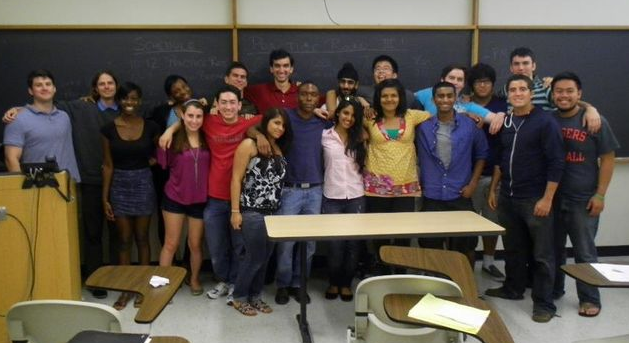 The Rutgers University Debate Union has developed a number of traditions over the years. Participating in these traditions has strengthened the team dynamic and sense of connection that club members have to each other over the many years of the Debate Union. Many of these traditions have taken shape in quite recent years with the advent of RUDU’s more competitive and sizable resurgence. Ashley Novak ’14 on her run to the 2012 Ironman Championship. She became the third ever Rutgers Ironman Champion, defeating 31 teammates for the title. The Ironman Tournament is held at the end of each season and pits the best individual RUDU debaters against each other for 1:1 half-rounds. Ironman is single-elimination with all rounds flip for sides. The tradition is that cases should be based on humor and often good-natured ad hominem attacks on one’s opponent, with the preference being that each case either makes the actor one’s opponent or directly involves an action for or relating to one’s opponent. The final round is typically a full-length round, held before the entire club. The first Ironman Tournament was held in 2008 and involved eight individuals from RUDU. In 2011, with the increasing size of the club, sixteen debaters were invited. In 2012, with further increases, thirty-two debaters participated. In 2012, both semis and the final round were held before the entire club at the Senior Banquet. In 2013, the tournament was cancelled after two rounds. In 2014, the tournament was reborn as the “Would You Push the Button?” tournament with linked resolutions and a discouragement of direct ad hominem, while still keeping the spirit of a fun and light-hearted tournament. The typical sign of a Waffle House restaurant. 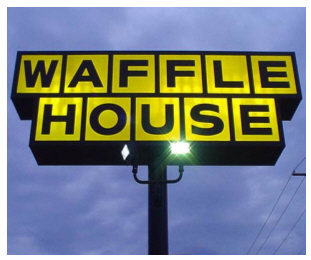 During the 2009-2010 season, the first for Coach Storey Clayton, RUDU made several trips to Baltimore, DC, and Virginia, with Clayton discussing the amazingness of Southern food chain Waffle House. The team traveling with him disbelieved the existence of Waffle House, despite the appearance of several roadside signs. On one trip late in the season, returning from the University of Virginia, Clayton even promised to take the team to a Waffle House, but the surprising lack of them in Maryland around Baltimore or less than an hour north of Baltimore prompted the team to stop early and get Taco Bell instead. The next year, Clayton resolved to take the team to Waffle House on a trip south. Soon after doing so, nearly the whole club fell in love with WH’s cheap food, cheezy jukebox music, friendly waitstaff, and big yellow signs. Farhan Ali became known for ordering almost everything on the menu but being unable to eat more than a third of it, while Chris Bergman and Ashley Novak opened the tradition of splitting chocolate pie after they won the UMBC tournament in December 2010. The tradition became a ubiquitous fixture of return journeys from southern tourneys, narrowly escaping a threat from the first trip of 2011-2012, after Johns Hopkins. On that trip, a busload of Villanova University cheerleaders arrived at the 77A Waffle House (first one north of Baltimore) simultaneously with RUDU. The ensuing overcrowding of the WH made the wait over an hour for the suddenly swamped restaurant and prompted some novices to seek recourse at the Burger King across the street. Despite this negative experience, those novices gave WH a second chance and the tradition is maintained. Friendly’s is also becoming a fixture of RUDU team dinners, especially in the north, where no Waffle Houses exist. While not quite at the level of Waffle House yet, these have established their reputation on the basis ice cream sundaes, vegetarian side-item meals, and insidious claw machines. The RUDU contingent at William & Mary poses for a team photo at a Waffle House outside Richmond on the long drive back from southern Virginia. 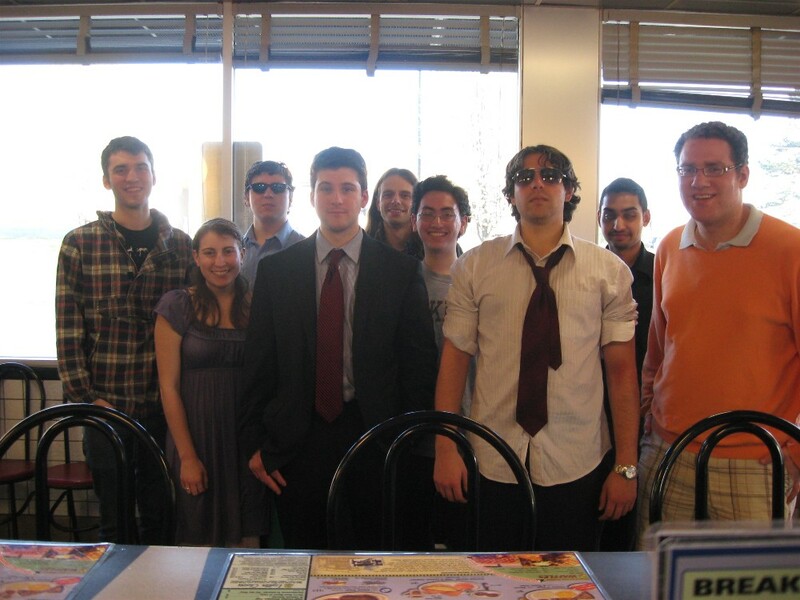 Left to right: Gordon Morrisette, Ashley Novak, Adam Bomeisl, David Reiss, Storey Clayton, Chris Bergman, Kyle Bomeisl, Farhan Ali, & Stephen Yellin. The iconic end-of-year shot for 2011-2012 with formal Banquet attendees. Left to right: Thomas O’Rourke, Quinn Maingi, Deepta Janardhan, Asher Wasserman, Henry Phipps, Corey Girard, Rachel Cusumano, Russell Potter, Adam Bomeisl, Kurt Falk, Ashley Novak, Storey Clayton, Daimler Vadlamuri, Amanda Gaetano, Chris Bergman, Stephen Yellin, Bhargavi Sriram, Dave Reiss, Alex Jubb, Nisha Kumar, Arbi Llaveshi, Jason Boyle, Shireen Hamza, and Cathy Guo. The Senior Banquet is a relatively new but popular RUDU tradition, starting somewhat informally at the end of the 2010-2011 season at Old Man Rafferty’s in downtown New Brunswick. 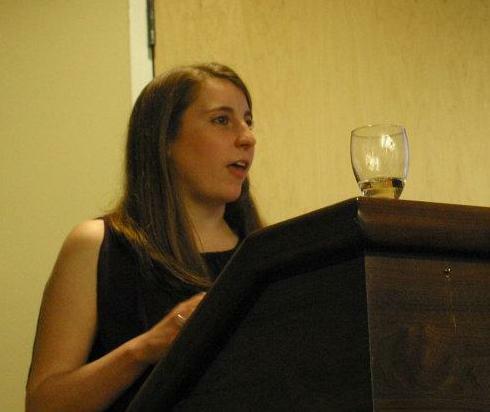 The Banquet honors graduating seniors with farewell speeches and, in 2012, featured the semifinals and final round of Ironman as well as a RUDU Feud contest featuring team memes and superlatives. The Banquet is a formal event and can showcase individual awards handed from seniors to ongoing members of the club, such as Farhan Ali’s passing of his beloved “beepy timer” to Bhargavi Sriram to honor her perseverance. 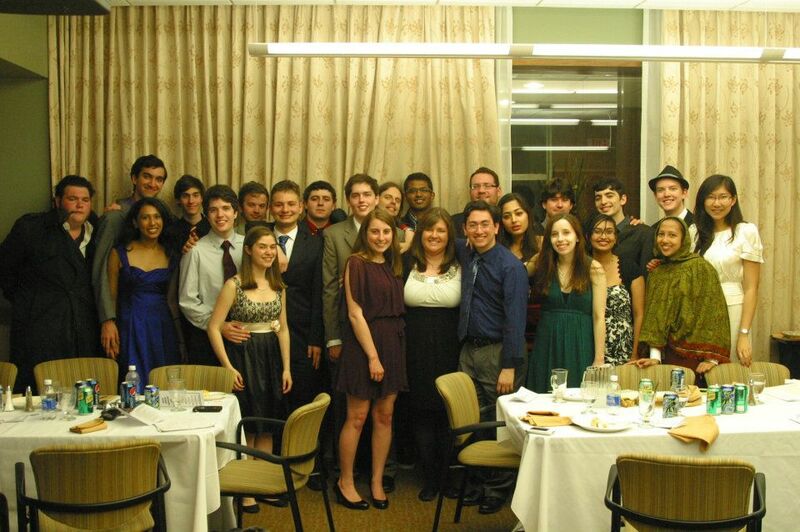 The 2012 Senior Banquet set the precedent of being held in an actual banquet space, one of the formal dining rooms above Brower. The official team picture was taken the night of the Senior Banquet in both 2011 and 2012. This tradition has continued and grown, with the new Livingston Dining Commons hosting the 2013 and 2014 Banquets which continue to include Senior Speeches, RUDU Feud!, and the finals of the 1:1 In-House Tournament. Novice Retreats have also been increasing in formality and duration with the increase in size and stature of RUDU. The first official Novice Retreat was held on a Saturday early in the season during September 2009. These have been opportunities, once or twice a year, for varsity, coaching, and former members of RUDU to train incoming first-year debaters in the fine art of parliamentary debate to give them a head-start on their novice season. Most have been well-attended, especially the two held right before the open of the 2011-2012 season, with most (but certainly not all) RUDU members having first been trained by one. The second 2011-2012 Novice Retreat was made especially dramatic (and slightly smaller) by the arrival of Hurricane Irene in New Jersey the night before the Retreat. Five of the novices trained in that Retreat became some of the most dedicated members of the 2011-2012 squad, including two members elected to Executive Board that winter. The largest RUDU Novice Retreat ever was held in August 2013, with 43 new recruits attending. Mark Zuckerberg has indirectly had a great influence on the development of the Rutgers University Debate Union. Early in the 2010-2011 season, RUDU started a Facebook group, closed to the public but open to all RUDU members. The group has since become a phenomenon, featuring hundreds, if not thousands, of threads and spanning every topic area from planning events and case ideas to personal details of RUDU members’ lives and memes about the team. The Group has become the central means of club organization, especially for team discussions about important decisions and policies, as well as for team bonding in all manner of ways. The Group has well over 200 members, most of whom are actively involved in both the club and the Group. 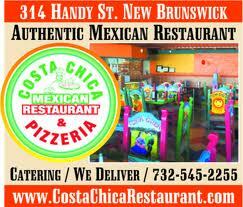 The logo of Costa Chica Restaurant in New Brunswick. For years prior to the 2012 tournament, the post-Tournament dinner to celebrate the successful conclusion of the Rutgers Invitational was held at Costa Chica Mexican Restaurant in New Brunswick. Many objected to continuing the tradition in 2011, arguing that the restaurant was kind of bad and especially unfriendly to vegetarians, of whom there are many on RUDU. This argument, combined with the relative distance of Costa Chica from the College Avenue campus, led to the cessation (or at least suspension) of this tradition in 2012. That dinner was held at Old Man Rafferty’s.